In an innovative critique of traditional approaches to autobiography, Anne E. Goldman convincingly demonstrates that ethnic women can and do speak for themselves, even in the most unlikely contexts. 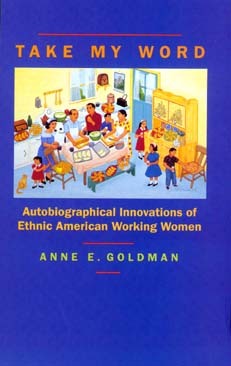 Citing a wide variety of nontraditional texts—including the cookbooks of Nuevo Mexicanas, African American memoirs of midwifery and healing, and Jewish women's histories of the garment industry—Goldman illustrates how American women have asserted their ethnic identities and made their voices heard over and sometimes against the interests of publishers, editors, and readers. While the dominant culture has interpreted works of ethnic literature as representative of a people rather than an individual, the working women of this study insist upon their own agency in narrating rich and complicated self-portraits. Anne E. Goldman is Assistant Professor of English at the University of Colorado, Boulder.